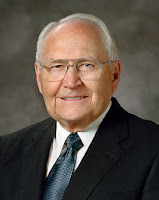 Elder L. Tom Perry (1922-2015) was called as an Assistant to the Twelve in 1972, then as a member of the Quorum of Twelve Apostles in 1974. At the time of his passing at age 92, he was the oldest living general authority and the third in seniority among the leading quorum. "We all make daily entries in our book of life. Occasionally we examine the entries we are making. What kind of memories will flood your mind as you examine the pages of your personal entries? How many pages will contain 'I wish I had' entries? Will there be entries of procrastination and failure to take advantage of special opportunities? Will you find entries of thoughtlessness in treatment of family, friends, or even strangers? Will there be those of remorse resulting from acts of unrighteousness and disobedience? 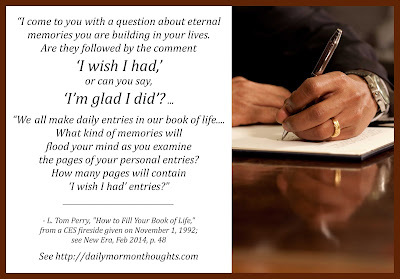 "My counsel to you is to fill up your memory bank and your book of life with as many 'I'm glad I did' activities as you possibly can (see Mosiah 2:41). "Find the commitment and discipline to seek after those positive experiences that will lead to liberty and eternal life. It is my witness to you that God lives. It is by conforming our lives to His law that we will find true happiness here and eternal opportunities in the life to come." Elder Perry presents an interesting question to ponder. As we reflect on the memories of our lives and think about past events or activities, do we remember them with fondness and gratitude ("I'm glad I did"), or with regret and dissatisfaction ("I wish I had")? Elder Perry's encouragement was to endeavor to make as many "I'm glad I did" memories as we can. That means living each day as well as we can, making the best possible choices, ensuring that priorities are clearly defined and carefully followed, and seeking always for spiritual guidance.